When I brought my trailer home in late Sept. I couldn't get the a/c or the heat to work. Took the a/c unit apart to find the board was fried due to a lizard got in there. My replacement board showed up the day I was leaving on my first trip out with this trailer, so just in case we grabbed a small electric heater because it was going to be 25* in Maine that night. After putting the new board in the a/c unit works fine, but the heater still does not work. Today I finally had time to look into it more. I took the board out of the furnace and cleaned up the contacts, checked the volts. I think everything is right. I talked to my father he said that the fan on the furnace should come on for a few seconds before the pilot will light. Is this true? That does not happen in my case. So... My question is. Could it be the board at this point? Or the blower motor? I really hate to just buy parts that I don't really need, also don't like paying other people to do my work. It is an Atwood 8525-III DCLP. Yes the fan should work before any thing else it's call pre purge the same thing happens when it's through heating (post purge) the ideal is to blow any propane out of the fire box so it does not go boom when it lights. 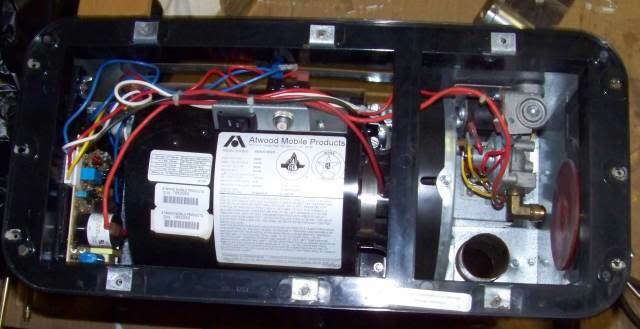 Your problem may well be the fan motor did a check list come with the board? You may try twisting the thermostat wires together and see what that does it will not do any thing until it has a signal from the thermostat. The board I replaced was in the ac unit. The board I pulled out and cleaned up today was the board in the furnace. Still no fan action. Maybe next chance I get I'll try to make a jumper and run the fan motor. This service manual may help. It a newer 8525 - IV but it lists a 8525-III wiring diagram on page. 10 and 11. Any chance of a pic of the inside of the unit? If yours lines up with the 8525-III wiring diagram on page 10 then the relay is powering the motor and the T stat is sending the coil on the relay the power to pull in the relay. Does your look like anything in the pics I posted here? 3 basics steps then to dig deeper. 1. Does the unit have 12 volts DC at the main power terminals at the furnace? 2. The question is going to be is the T stat signal actually getting to the furnace? You can unhook the T stat wires and jumper the T stat signal down at the furnace and see it it runs. Or do a volt check on the T stat terminal at the furnace. Once you have proved that the t Stat signal is present, then need to start digging into the motor control. 3. The motor is 12 VDC. It is only 2 wires and you can hot wire it. Find the 2 wires on the motor. One is DC ground, the other the hot wire. It will go to the motor relay or the PC board pending what vintage you have. Do not get confuse with the sail switch wires, make sure the leads go to a power relay of some type. The sail switch wires come out of the blower housing that "looks" like the end of the motor. Need to find the motor windings. To check for open circuit, do an ohm check on the motor. It should have some level of resistance through the windings. If it is an open circuit, that is problem 1. If it has some resistance, Un plug it from the relay or relay on the PC board and hot wire it. It should run. If the motor runs, then need to back into what is holding out the motor control. A picture of what you have will help. I will see if I can find an older manual. What Mainah stated on the blower is correct. It 1st runs to purge and then a post purge to get ride of excess heat and any gas. If the motor does not run you will not get much else to start. The blower pressure has a saftey in it through a sail switch to even allow the gas valve to turn on. No blower or not strong enough of a blower pressure not much else is allowed to work. PS Check for lizards.... LOL I never would of guessed that one. Mine looks like pics 1 & 2. I'll check all that out maybe this coming weekend if I get a chance, it's a little to dark out at 5pm when I get home from work. Just trying to get the heat working so once hunting season is over (and the holidays) I can start my list of to repairs and mods. A little heat would be nice in early spring and fall trips too. If it tests bad Ignitor Board Index page they make really nice stuff I think the stock board only strikes once and the Dinosaur boards try 3 times to light some of the newer ones will even turn off the fan if it does'nt light. I have used two of them and both work flawlessly. When I was trying to figure out why my ac and heat didn't work in Sept. I started off by putting in a new thermostat. No time to work on it this weekend. My pellet stove died. So when I went to look at new ones I decided to go with a wood stove. That changed my plans of hunting and working on the camper. To cutting and hauling fire wood. The relay that is mounted to the top/side of the blower motor. Can just that be replaced? Sitting in a snow bank today playing with it. I've volt tested everything in there with 13 volts in all connections. On that relay if I jump the top wire which is hot to the bottom that goes to the motor it fires right up. I turned the gas on jump the wire and she fired up. So I guess I'm at the point of. Is it my board not telling the relay to make contact? Or is the relay no good? I do not know your series and I have no pics of the setup. Got any? Just reading the 8500 series III diagram, the 12 volt control signal comes from the T stat. It fires the blower relay and then also powers the sail switch in series with the over temp switch on the way to powering the ignition board. Since you hot wired the motor with the T stat on, once the sail switch made, the control board became active and purge timer started and soon fired the gas valve and the ignition and all is working. Great! Do I have this right? I'm just reading the wiring diagram. You have to look for this in the furnace. 1. Turn T stat on. 2. 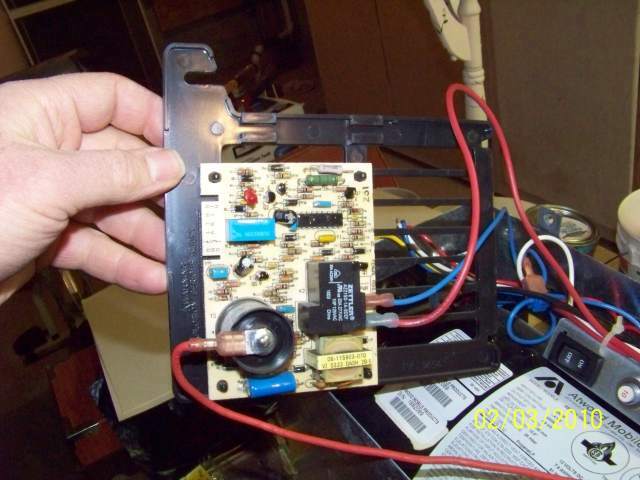 Do a volt check on the relay pin from the incoming power source to the relay contact. This should be a red feed wire from the circuit breaker on/off switch. 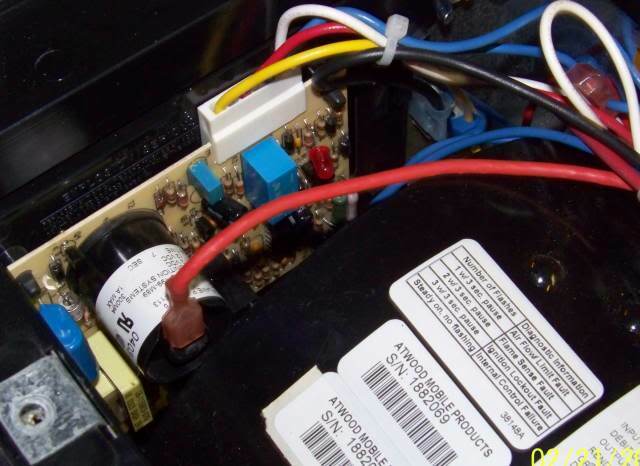 If you have 12 volts there then high amp power "to" the relay is good. 3. Also the T stat control signal wire to the relay coil should be hot. This means you have control signal power to the coil. if not check for corrosion on the pins. When the T stat just comes on, you should hear a faint click if all is working from the relay. Maybe toggle the power switch at the furnace unless you have a helper to toggle the T stat. If no click, keep going digging some more. 5. If you made it to this point, the relay should be energized and the contacts closed. Now do a 12 volts on the contact pin on the red wire heading to the motor when the T stat is on. You should have power at the outgoing pin. If not, the contacts inside as burnt open or the relay coil is dead. Your close. This points to a bad relay inside, a bad ground on the relay coil, corrosion on the coil signal T stat wire pin trying to turn the relay on or the high amp power wire to the relay contact that runs the motor. I would not bypass anything other then a test it sounds like some thing in the proofing chain is not satisfied. I'm going to say the thermostat closes the relay then supplies the fan, sail switch and over temp the end of the chain goes to the ignitor board it then decides when to open the gas valve and fire the spark. One terminal on the thermostat (they should be marked R and W for heat) should read 12 v to ground the other one should have 12 volts also when there is a call for heat. After reading Mainah's note, on page 10 and 11 there is 85-III local sense and 85-III remote sense. Do not know the difference but the color codes appear different for the motor and relay coil ground. We also do not know if the relay is 1 or 2 contacts. Cannot tell from the limited diagram they give. The sail switch could be powered by a contact of the relay or just tied in with the T stat feed. They do not give enough detail. If we knew where and how you jumped the motor hot from where and to where it might help. Regardless, it points to the relay not energizing the motor power. Ill have to bring the computer out with me and check it out. For today I give up! Everytime I touch this trailer it's a nightmare and I'm getting frustrated. So for now I'm heading up to the sugar house to gather sap and boil for the night. Thanks for all the help so far. I may just drop it off at a rv repair shop soon.